Being a working homeschool mom means that you run out the door in 5 minutes or less. In that time, you lose your keys twice, your cell phone once, and you leave your coffee by the microwave. Many people are worried about homeschooling and working, either inside the home or outside the home, because it is way too much to handle. I have to admit most days I agree. Being a mom is hard. Being a homeschool mom is hard. Being a working homeschool mom is hard. It’s all HARD. 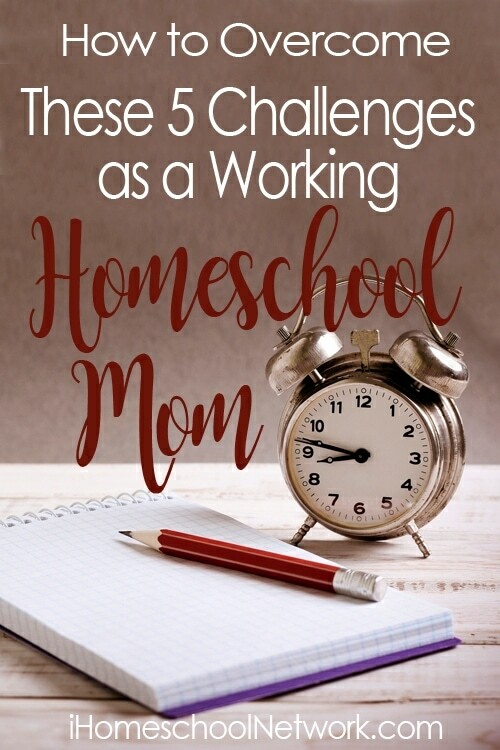 Today, I want to talk about 5 challenges working homeschool moms face and how you can overcome them. More often than not, you need a curriculum that works for you and your family, not against you. One major lifesaver for me has been finding programs online that my children can do without me looking over their shoulders. Another is saving hands-on projects for my days off. Lastly, have a list of work that can be done on the go. Another reminder is that homeschooling is flexible and some things can be done in the car (like audiobooks) at appointments (reading, workbooks, online work with tablets) and outside. Your homeschool can look any way you need it to in order to reach your goals as a family. You don’t need to follow the traditional school schedule. You can homeschool on weekends, evenings, year round – whatever works for you. One major problem for a working homeschooler is that others don’t understand the struggle of having little to no control over your schedule. As homeschooling moms, we all have a schedule, whether you write it down in a planner or go by the seat of your pants. We all have a list of things we must do. Add in a working and that list just doubled in size. Mix in the fact you may not control your own schedule and you have a recipe for disaster unless you figure out how to guard the time you do have. The best way to do that is set priorities. Find out what must be done and how much time this will require. Use the planner that works for you and be as scheduled as you need to be for you and your family. Lastly, recognize the dangers that can interfere with your homeschool time and be sure to include a “make up day” in your schedule for unexpected events such as work schedule changes, emergencies, storms, power outages, and sickness. Yes, homeschooling does allow you to have more time than others might have with family. However, between working, teaching and running a household, your time can be pretty much gone by the end of the day. Some get hung up on the great quality time vs quantity time debate and if that is your thing have at it. Personally, I think all time should be quality time, which means making the most of the time I do have. Find a way to connect with our spouse and children on a daily base. We can accomplish this in as little as 10 minutes a day. 1. Be sure to spend at least 5-10 minutes with your mate. Pick a time that works best for you and communicate. 2. Spend at least 5-10 minutes each day with your children. Involve them in what you are doing, listen, and be genuinely interested. 3. Try to eat one meal together as a family each day. Keep it simple! I find it interesting that when I am flat-out tired after a long day, my first instinct is to remove my “me time” from my to-do list. “I don’t have time for that!” You know what that gets me? Stressed, fried, and if I am being honest, cranky. After all, chances are that I haven’t sat down to eat, never mind to rest for 5 minutes in the whole day. By not finding time for yourself to recharge, you are setting yourself up for burnout. I’ve been there, done that, and it wasn’t fun. Therefore, it is vital for you to find time for yourself. You don’t need hours. Even a few minutes each day goes a long way. You don’t need to do it alone. I encourage you to find other moms that you can talk with, vent with, cheer with and who really “get it.” We all need a friend sometimes. In talking with other working homeschool moms, they say they get support from family (mates and children included), their teammates at work, homeschool groups, blogs, and friends. 2. Join “The Club” an online community for support, encouragement, and inspiration. Hello, My name is Jen and I am the writing voice, blogger, and coffee drinker behind Practical, By Default. I host the Working Homeschool Mom Club and help working parents balance work and homeschooling by providing encouragement, support, and inspiration. I’m excited I found your site. I work from home 30 hours a week, homeschool three kids, I am currently helping my husband begin his own business while he still works full time. This is the hardest season I have been in. We’ve also been married 15 years, we have two cats and a dog too, so I found some common ground reading your bio. I am not on Facebook because it kills the last bit of free time I have, but I need encouragement! Thanks for your site. Hey Deborah. I am so glad you found it. Working and Homeschooling is one of the hardest things I’ve done yet to date. I now work 4 jobs-whew. BUT You can do it! My animals are my babies, lol! Big one sometimes 😉 The one thing I am discovering is how worth all the hard work it is. At the end of the day as I fall exhausted into bed, It is worth it. I am sure you are finding the same time. <3 PS. Facebook does kill time, lol I use a timer for that exact reason. Hang in there and you can do it! !